Yellow fever is a serious viral infection that is spread by certain types of mosquitos. There is a vaccine to prevent Yellow fever and is a very rare cause of illness in travellers due to the success of the vaccine. 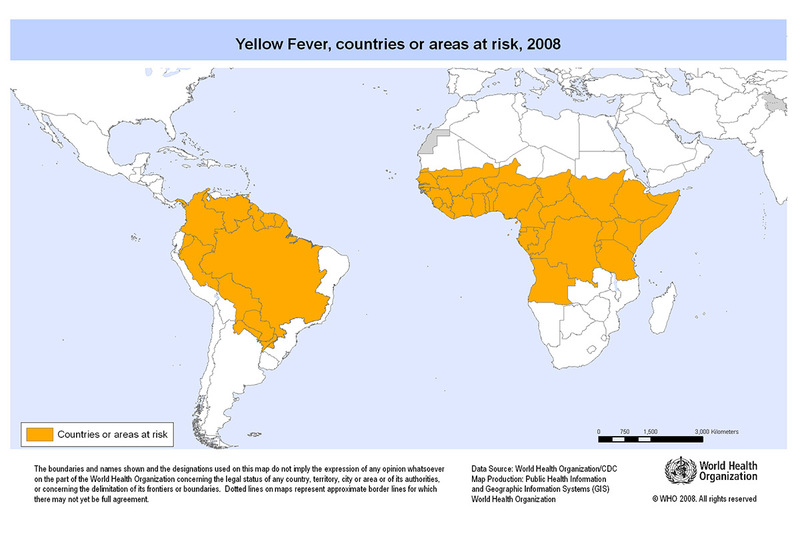 Countries at risk Yellow fever occurs in parts of Africa and South America. In many of these countries and surrounding countries you will be asked to provide proof of a Yellow fever vaccination in the form of a certificate. It is very important to wear insect repellent when travelling to high risk Yellow Fever areas. Ideally insect repellents that are used should contain the chemical ingredient DEET. Any insect repellent which contains DEET 50% or more is needed in high risk areas. The initial symptoms of Yellow Fever takes about three to six days to develop and include fever, headaches, muscle pains nausea and vomiting. This takes about three to four days to pass and most people make a full recovery. Around 15% of people go on to develop a more serious stage of the disease and includes symptoms such as jaundice and a deterioration of kidney function. Up to half of the people that develop these symptoms will die. The vaccine takes about 10 days for a full optimum protection and therefore the yellow fever certificate takes 10 days to come into effect once the vaccination is completed. It is therefore vital to leave enough time before travel to get the vaccination done. Most countries with a risk of yellow fever and surrounding countries will ask to see yellow fever vaccination before entry into the country. Failure to provide a valid yellow fever certificate may lead to a traveler being quarantined, immunized or denied entry.